For the many people waiting.... the medium size 5/64" - 3/32" Lightning Locks are in. Sorry for the long wait. 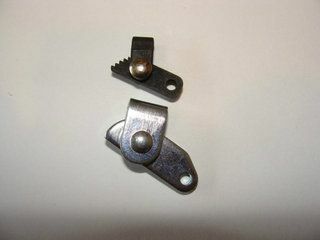 Below is the 5/64" - 3/32" Med Lightning Lock shown beside a medium camlock. Note the very sharp teeth! That oughtta cut down on the refusals! I just got the 1/16" lightening locks that you sent me in the mail Marty. Wow, do they ever look good. Sturdy, small, sharp teeth. Very well made. Thanks for the great products. Picked some 1/16 locks up at Halfords. Will be using them for my Lynx snares this season. Really like the low profile these locks make.